The Gijjhakuta, the Vulture Peak, was the Buddha’s favorite retreat in Rajagaha and the scene for many of his discourses. According to the commentaries this place got its name because vultures used to perch on some of the peak’s rocks. The several rock shelters around the Gijjhakuta, its fine view across the valley, and its peaceful environment made it the perfect place for meditation. Climbing the steps that lead to the top, the pilgrim passes a large cave. This is the Sukarakhata (the Boar’s Grotto) where the Buddha delivered two discourses, the Discourse to Long Nails and the Sukarakhata Sutta. Climbing further, the pilgrim can see the ruins of stupas and the foundations of a small temple built on the summit in ancient times. When the simple and devoted Chinese pilgrim Fa Hien came here, he was deeply moved by the atmosphere on the Gijjhakuta. ‘In the new city, Fa Hien bought incense, flowers, oil and lamps and hired two monks, long residents in the place, to carry them to the peak. When he himself arrived, he made his offerings with flowers and incense and lit the lamps when the darkness began to come on. He felt melancholy but restrained his tears, and said, ‘Here the Buddha delivered the Surangama Sutra. I, Fa Hien, was born when I could not meet the Buddha and now I only see the footprints which he has left and the place where he lived and nothing more.’ With this, in front of the rock cavern, he chanted the Surangama Sutra, remaining there overnight and then returned towards the new city.’ In Dharmasvamin’s time (13th century), the Gijjhakuta was ‘the abode for numerous carnivorous animals such as tiger, black bear and brown bear,’ and in order to frighten away the animals, pilgrims visiting the Gijjhakuta would beat drums, blow conches and carry tubes of green bamboo that would emit sparks. A Buddha statue, dating from the 6th century CE, found on the Gijjhakuta, is now housed in the Archaeological Museum at Nalanda. 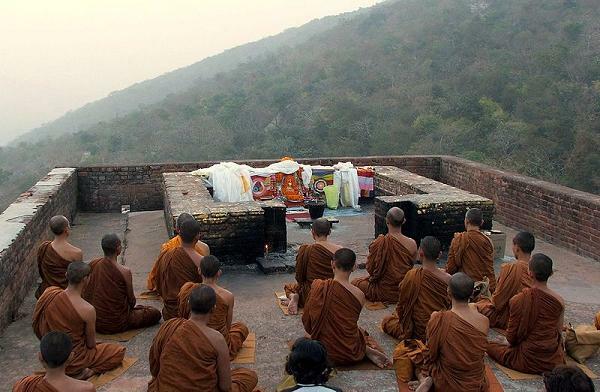 The Gijjhakuta is located about 5 kilometers south-east of the town of Rajgir and is a popular destination for both local tourists and Buddhist pilgrims form overseas. Because the Sadharmapundrika Sutra (Lotus Sutra) was taught on the Gijjhakuta, the place is particularly popular with Japanese and Korean pilgrims. 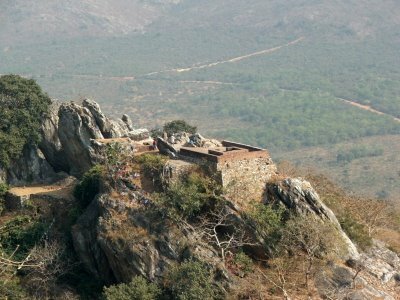 Vulture Peak may be the second "holiest" place of Buddhism, after the Maha Bodhi Temple because this is the place where the Buddha spent so much time on retreat, meditating, and teaching so many discourses. Many Buddhists prefer to take the climb up on foot to take the same steps as the Buddha and his closest disciples. It is also very close to the location of the First Buddhist council at Rajagaha. 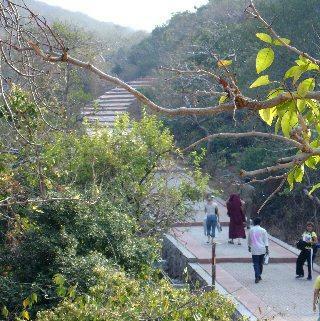 The Triple Gem is fully represented at Vulture Peak by the fact that Buddha spent so much time there, also teaching Dhamma and the other Sangha members going there for instruction, to teach, to meditate, and to compile all of the teachings at the First Buddhist council at The Sattapanni Cave, which is about 5 km from Vulture Peak. This page was last edited on 29 April 2012, at 21:27. This page has been accessed 133,576 times.